Crucial goals by Rupinder Pal Singh (57’) and Simon Child (59’) in the dying minutes of the match saw Delhi Waveriders get past the dangerous Kalinga Lancers with a 6-4 win here at the Coal India Hockey India League. While a win for the Kalinga Lancers tonight would mean that they would almost certainly confirm their spot in the Semi-Final Weekend in Chandigarh on 25 February 2017, the home team Delhi Waveriders vied for their second win in the league to keep their hopes intact to stay in contention and the home team did not disappoint as they came up with an inspired performance ensuring a strong start to put pressure on the visitors. Kalinga Lancers’ keeper Abhinav Kumar Pandey was kept busy at the post early in the game, thanks to the heroics of Mandeep Singh who worked in tandem with Junior India teammate Santa Singh to put pressure by finding gaps in the circle, creating chances at scoring in the initial minutes of the game. They handed an early blow to the visiting team when Talwinder Singh played one-to-one with Simon Child before he could take the strike at the post. The 9th-minute goal put them in a bold 2-0 lead. 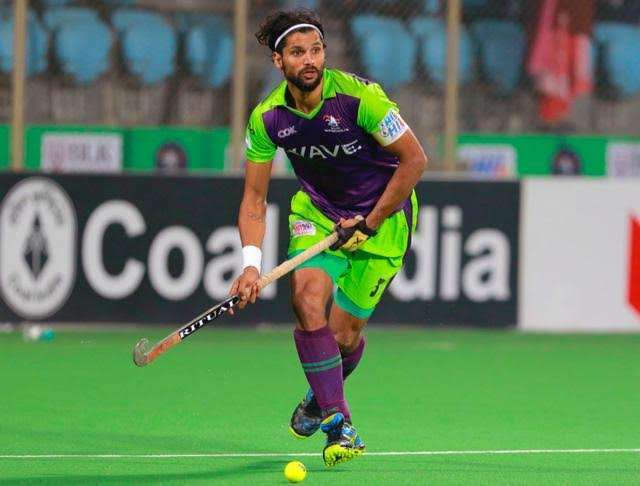 Mandeep Singh continued to enthral the home crowd with his exceptional stick work when he won his team their first PC in the 21st minute. But Rupinder Pal Singh’s flick to the centre of the post was padded away promptly by Abhinav Kumar Pandey denying the Delhi Waveriders a further lead. Interestingly, Rupinder has been successful at converting just one goal from the 10 PCs he has attempted this season. In the 24th minute, Mandeep earned yet another PC for the home side but Justin Reid-Ross’s attempt was denied. Though Kalinga Lancers won their first PC with just two minutes to go for the first-half, they failed to convert it. But the Delhi Waveriders rallied to work a set piece almost immediately when they earned three back-to-back PCs in the 29th minute. They were third time successful when Justin Reid-Ross fired the ball away to the keeper’s left to extend their home advantage to finish the quarter with a 3-0 lead. Moritz Fuerste played a crucial role in earning his team a PC in the 38th minute after he made a perfect assist to Adam Dixon who found Rupinder Pal Singh’s foot in the circle. But a miss-trap denied them a goal. However, they came back strongly in the 40th minute when Fuerste came up with an inch-perfect dribble into the circle only to find an unmarked Dharamvir Singh who made no mistake in sending the ball past Delhi Waveriders’ keeper Vincent Vanasch. The field goal helped the visitors narrow the deficit to 2-3. A video referral by Kalinga Lancers’ Glenn Turner saw them being awarded a PC in the 42nd minute. But Vincent Vanasch came up with a class-act to save the fiercely struck drag flick by Fuerste to deny them an equaliser. With just 13 seconds left for the third quarter to end, Glenn Turner helped his team win another PC but a miss-trap by Billy Bakker saw them try a desperate variation. Though Tom Craig converted a goal, it was denied by the umpires after a video referral by the home team was upheld. The final quarter witnessed nail-biting action keeping the dynamic Delhi crowd on the edge of their seats. Though Delhi Waveriders did well with their defence to retain the lead, the dangerous Moritz Fuerste could not be stopped in the 54th minute when he was brilliantly assisted by Amit Rohidas that saw him beat Vincent Vanasch to earn a crucial 4-3 lead. But skipper Rupinder Pal Singh spoiled the Kalinga Lancers party when he converted a PC in the 57th minute to equalise the score to 4-4. The action didn’t end there when Simon Child was successful in converting a field goal after he was set up by Mandeep Singh to hand the home team a 6-4 victory. Dharamvir Singh of Kalinga Lancers was awarded with a prize money of Rs 50,000 for scoring the Coal India Goal of the Match from Shri. G.K. Vashisht, General Manager, Sales & Marketing Coal India Ltd.
Mandeep Singh of Delhi Waveriders won the prize of Rs 25,000 for being the Hero Young Achiever of the Match from Mr. Hans Erik Tuijt, Chairman, Euro Hockey League. The Airtel Most Entertaining Player of the Match was awarded to Benjamin Stanzl that came with a prize money of Rs 25,000 and presented by Ms. Marijke Fleuren, Member FIH Executive Board & President European Hockey Federation. Rupinder Pal Singh of Delhi Waveriders was declared the Man of the Match and was awarded a prize money of Rs 50,000 by Mr. V.K. Aggarwal, Managing Director, Prayag Polymers India Pvt. Ltd.
On 13 February, Jaypee Punjab Warriors will take on Uttar Pradesh Wizards in Chandigarh.